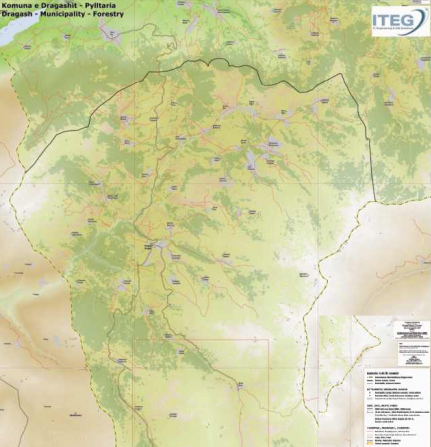 The philosophy of GIS services is to provide value added outputs and products to our clients for better informed decision-making.ITEG are specialists in analysing spatial information and use a variety of software packages and programming languages to process and analyse data. The use of satellite imagery provides better insight into temporal changes and retrospective analysis. By using such techniques, the company has captured information such as the extent of deforestation and afforestation in western Kosovo, mapped the extent of aromatic species in pilot areas and mapped changing agricultural use patterns. 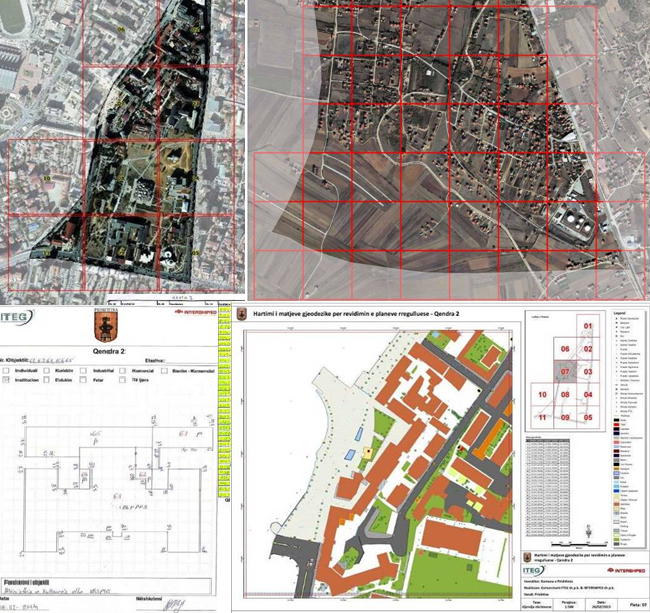 Extraction of Cadastral Vector Data/Layer for the Mapping of Municipal Parcels for 9 Municipalities. Input data: textual data, Graphic data (vector layer and cadastre zone boundaries) and Orthophotos. Report: Comparing discrepancies by identifying and presenting key differences, such as number of parcels, total land area and illustration of the findings by examples. Geodesy field measurement conducted for Prishtina center (Lot2 = 30 Ha) and Bernica village (Lot 5 = 123.9 Ha & Lot 7 = 110.20 Ha). Creating digital map for drafting regulatory plans for Pristina Municipality. Official request was to carry out detailed terrain surveying in the scale 1: 500 at the local coordinate system Kosova Ref 01 with orthometric quotas. Based on these field measurements and data collected it will be needed to prepare digital maps and terrain models with current situations (all buildings and other facilities on the ground) documented with textual data. Generating using Remote Sensing the Forest and Grassland layers for Dragash and Prizren Municipality. The Counter lines were generated every 25m , 3D display of Prizren & Dragash, March 2010. The main objective of this project is: i) assist the MRWC in the review and update of the asset inventory into the GIS system; ii) organize and supervise the block-mapping exercise in collaboration with the MRWC and input the mapping data into a GIS system;iii) assess the performance of the GIS section of the MRWC and assist the team in the improvement of their work. The second contract component aims at compiling a new customer connection database through the Block-mapping exercise and including the collected data in a compatible way with the asset inventory. 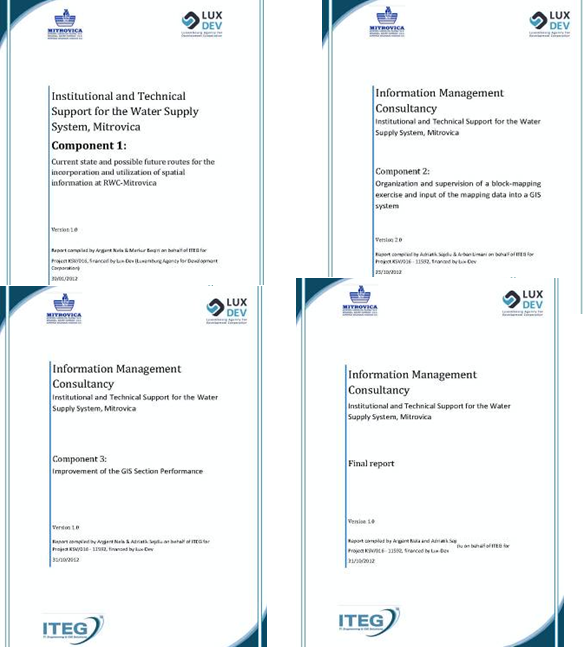 The third contract component focuses on the capacity building of the GIS section. The GIS section is expected to be autonomous at the end of the consultancy contract, fulfilling the necessary tasks that include the maintenance of data, the provision of data visualization, query, analysis and the ability to create and edit geographic features.